From Chennai (Madras), Mahabalipuram is 58 km away, on the shores of the Bay of Bengal, along the Indian coast. Known for its rock carvings and monumental sculptures, the famous shore temple, the only survived the ravages of nature. Also known as Seven pagodas (temples), six now lies submerged in the sea. Mahabalipuram temples whose architecture is inspired by the Pallava art, was built between 830 - 1100 AD. A very rude cruel king Mahabali ruled here, and in a severe battle king Mahabali was killed by Lord Vishnu and the place was named after the dead of Mahabali. 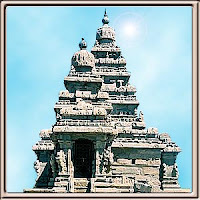 During the rule of King Narasimha Varman I the name was changed to Mahabalipuram Mamallapuram. There is a history in this regard. . King Narasimha Varman was a great and brave warrior, and he got the title Mam alla which means' the great wrestler. After his name was converted from Mahabalipuram in Mamallapuram considering the great king and his achievements. Mahabalipuram has nearly forty monuments of different types including an "open air bas relief" which is the largest in the world. There are two hills in Mahabalipuram, about 400m from the sea, where both parties have 11 excavated temples, called Mandapas. Out of a big rock standing free nearby there is a "cut out" temple, called a "Ratha" which is unusual for Mahabalipuram. The second tray smaller and standing about 200m to the south, is shaped rathas five, and three big sculptures of a Nandi, a lion and an elephant. On top of the big hill there is a structural temple, and a small distance to an impressive start to the Vijayanagar gopura. Five Rathas: The five Rathas of Pandava includes Dharmaraja, the Bhima, the Arjuna, Draupadi and the Sahadeva,. By two smaller stones were carved into an elephant and a lion. Behind the Draupadi and Arjuna, who is on a common basis, there is a Nandi. Shore Temple shrines: There are 3 shrines in the Shore Temple, two of them are of Saiva and the third is the Vaishnava, with a picture of Lord Anantasayi made of living stones. There is Vimanas the Saiva shrines, but none in the third, it seems to have disappeared with time. Built by Narasimha Varman II Rajasimha, maker of the Kailasanatha temple in Kanchipuram in the 8th century, this is one of the earliest structural temples in Tamil Nadu. Temple Of Sthalasayana Perumal : North of the larger hill is Sthalasayana Perumal temple and west of the five Rathas there are three more rathas, two side by side. Approximately 600 m north of Mahabalipuram, along the coast, is Saluvankuppam where there are magnificent excavated temples and in the vicinity of what is called a rock Mandapa with tiger heads along the margin of the "tigers Cave". Between Saluvankuppam and Mahabalipuram, less than 200m from the sea, stands another structural temple, Mukunda Nayanar. All the monuments are Pallava except that the original Sthalasayana Perumal temple was expanded in Vijayanagar times. Chola days belong to a Mandapa at the entrance to the municipality. The archaeological survey of India sent divers to begin underwater excavations in the area on 17 February 2005. As of 2001 India census, Mahabalipuram had a population of 12,049. Males constitute 52% of the population and women 48%. Mahabalipuram has an average reading of 74% higher than the national average of 59.5%: male literacy is 82%, and female illiteracy is 66%. In Mahabalipuram, is 12% of the population under 6 years. Anything that makes Mahabalipuram memorable, tradition, history, piety, western annals, and current importance as a center of tourism, and for centuries has been a center of pilgrimage, and even today attracts supporters and foreigners in large numbers.